Dr.N.V.Ramana had qualified in Indian Engineering services and was appointed as Military superintend. He worked as Assistant Engineer in Master Plan circle, APSEB. For 2 years before starting his Academic Career in JNTU 26 years ago. He is actively engaged in Teaching, Research, Institutional building and academic administration. 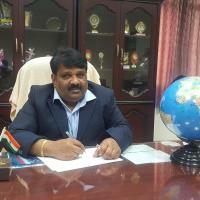 He is serving the university having worked as Head of EEE department, Vice-Principal of JNTUH College of Engineering Jagtial and presently working as Principal, JNTUH College of Engineering Jagtial, Nachupally (Kondagattu). Coming to his expertise in research, he has published 96 papers in various National and International journals and conferences. His commence knowledge empowered him to guide 6 Ph.D. students. Another great quality which balances his academic expertise made him to hold different positions like chair person, Board of studies for different affiliated colleges, Editorial board of member of Elsevier, Member of AICTE, NBA Committee, Member of UGC, NACC Committee. He is a Life member of ISTE and fellow member of institute of Engineers. His Passion towards Research made him to visit 15 countries to name few: USA, England, Canada, Germany, Newzeland, Australia, France, Switzerland and 31 cities like Newyork, Chicago, Sydney, Melbourne, Singapore, Paris, London, Auckland, Rome. He presented his research papers in various popular universities, to name few: Georgia Tech University-Atlanta, Virginia Tech University-Washinton, Nanyang University- Singapore, New Mexico University-Elpaso. He was awarded Best Teacher in Telangana Award.